Gerhard Brandhofer und Peter Micheuz stellen die aus ihrer Sicht fragmentierten Anstrengungen in der österreichischen Lehrerinnen- und Lehrerbildung vor. Sie skizzieren ein umfassendes Ausbildungskonzept, welches nicht nur die einzelne Lehrperson, sondern auch ihre Schule und ihre Netzwerke umfasst, und diskutieren Möglichkeiten zu seiner künftigen Umsetzung. New technologies in education play only a subordinate role in the Austrian school reform debates, although there are many initiatives and projects in that fi eld. These have led to a very heterogeneous digital map of Austrian schools which is – not least – due to a big digital gap between Austrian teachers. 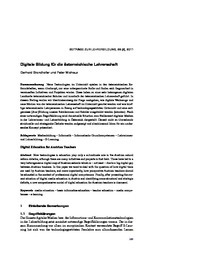 In this paper we want to deal with the question of how digital tools are used by Austrian teachers, and more importantly, how prospective Austrian teachers should be educated in the context of professional digital competences. Finally, after presenting the current situation of digital media education in Austria and identifying some structural and strategic defi cits, a new comprehensive model of digital education for Austrian teachers is discussed.